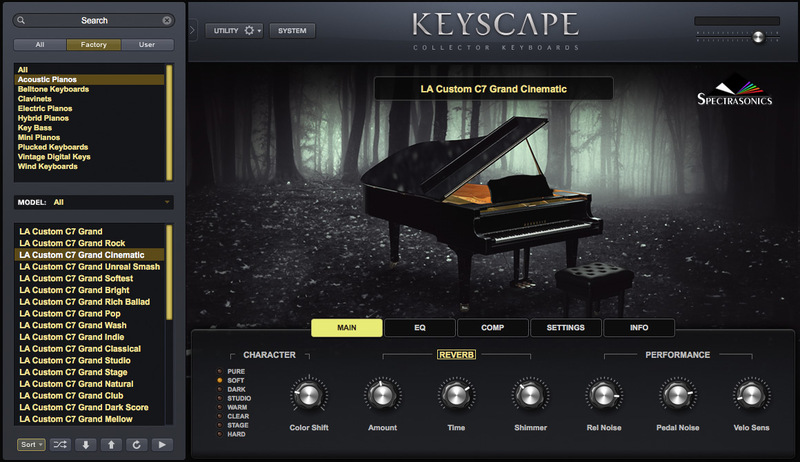 We are pleased to feature a very special instrument in Keyscape. The Yamaha® C7 Grand Piano is widely known as the most-favored piano for studio recording – however, this is no ordinary C7. This outstanding, custom-modified instrument belongs to renowned Los Angeles piano technician, Jim Wilson. Part of what makes it unique is that this C7 is fitted with Renner® "Blue Point" hammers with Weickert® felt – a special piano hammer felt used during the pre-Cold War "golden age of Steinway®.” This rare long-fiber virgin wool felt (which became available again after the reunification of Germany) contributes to the hammers producing a wider tonal spectrum. Jim spent many weeks manicuring the piano voicing for this project (which includes fine adjustment of the hammer felt density using special needles and a variety of techniques) to achieve the greatest possible dynamic range and color palette. The tone, dynamics, and sustain of this particular instrument are astounding. Special care was taken to create gorgeous warmth at softer velocities and at the same time, more bite at higher velocities. Jim was closely involved with our sound designers throughout the entire year-long development process and gave his blessing to the finished product. Our software team closely modeled the authentic behavior of subtleties like pedal noises and the intricate interaction of the release overtones. The user interface of each of the numerous patches was designed to offer useful new features like harmonic “Color Shift” adjustment, Velocity Curve matching to a wide range of keyboard controllers and our unique “Character” control – which allows for unprecedented versatility in creating different kinds of piano sounds for any genre. Superior attention to detail in every aspect of recording, sound development, and software design has culminated in an extraordinarily expressive virtual piano. 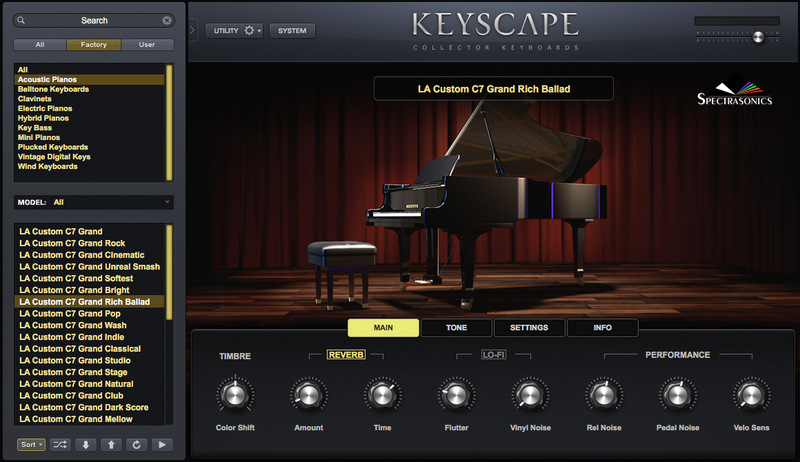 As a result, the range of piano tones in Keyscape allows for an incredibly versatile and inspiring playing experience. 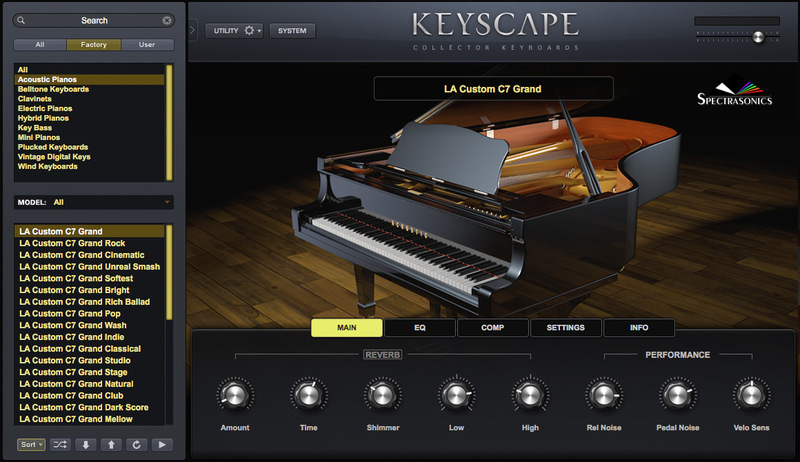 All musical instrument manufacturer and product names used in Keyscape are trademarks of their respective owners, which are in no way associated or affiliated with Spectrasonics. The trademarks of other manufacturers are used solely to identify the products of those manufacturers whose tones and sounds were studied during Spectrasonics sound development. 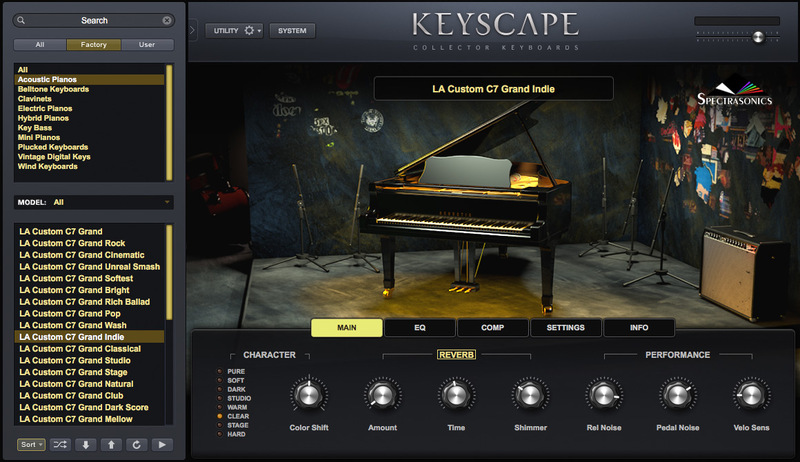 All names of musical artists and instrument inventors have been included for illustrative and educational purposes only and do not suggest any affiliation or endorsement of Keyscape by any artist or instrument inventor.